Eleven local chefs showcased their tapas style signature dishes at the Achievement Academy’s fifth annual Top Chef of Polk County event on February 25 at the RP Funding Center. Each dish was accompanied with a wine or libation the complimented the flavors of the dish. The sold-out audience of 250 guests was given the opportunity to sample each of the chefs’ dishes. The net amount of $148,000 raised at this event will benefit children with special needs at the Achievement Academy located in Lakeland. 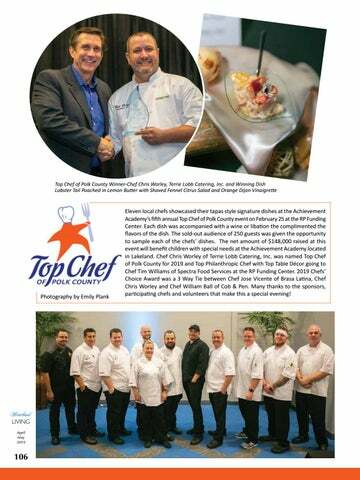 Chef Chris Worley of Terrie Lobb Catering, Inc. was named Top Chef of Polk County for 2019 and Top Philanthropic Chef with Top Table Décor going to Chef Tim Williams of Spectra Food Services at the RP Funding Center. 2019 Chefs’ Choice Award was a 3 Way Tie between Chef Jose Vicente of Brasa Latina, Chef Chris Worley and Chef William Ball of Cob & Pen. Many thanks to the sponsors, participating chefs and volunteers that make this a special evening!